Alberto was called to ministry during his last year in college. This calling drove him to search for a place that would equip him for pastoral ministry, having the right theology and proper hermeneutics. By God's grace, he was able to attend The Master's Seminary in order to pursue the degrees of Master in Divinity and Master in Theology. It was in Los Angeles, while attending seminary, that Alberto met his wife, Kathy. Born and raised in Germany, Kathy had recently moved to California to work as a nanny. Their daughter, Elisabeth Sophia, was born January 2018. 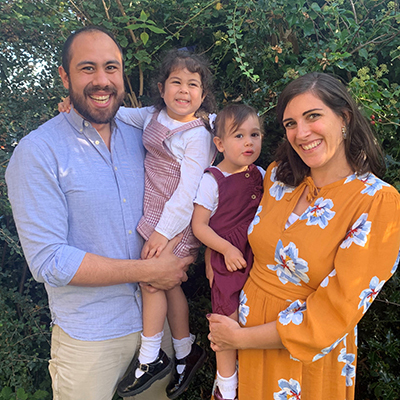 The Solanos moved to Mexico in 2017 to serve at a local church in Guadalajara, the second largest city in Mexico. They joined a group of people who have been congregating together for a couple of years. Together, they planted Iglesia Comunidad Bíblica church. Glorify God by making Christ known in the Spanish speaking world. Plant Iglesia Comunidad Bíblica church in Guadalajara (Mexico), and equip elders to oversee the congregation. Equip the people of the church through discipleship and various ministries. Evangelize and set up an outreach ministry to share the gospel in the city. Train national leaders for pastoral ministry through a TMAI extension. This involves the training of laymen and existing local pastors to accurately handle Scripture. Pray that God would be most glorified in our lives and ministry. Pray for Alberto as he trains church leaders and preaches God's Word. Pray for Kathy as she continues to learn Spanish and gets to know people in Mexico. One-Time Donation. Make a one-time donation by filling out the form at the bottom of this page. This one-time donation will be utilized to meet church needs. Credit Card Monthly Giving. If you would like to set up a recurring credit card donation to the Solanos, please utilize the giving box at the bottom of this page. The amount selected will be automatically withdrawn from your account once a month. Monthly Direct Deposit. To set up a monthly direct deposit, print this form and follow its instructions (use the missionary project "Mexico Church Strengthening"). Give via Check. To give by check, send a check payable to "GMI" and write "Mexico Church Strengthening" on the memo line. Send the check to: GMI at 13248 Roscoe Blvd.Sun Valley, CA 91352.